In November 2005, I took a trip to Italy to research some of the places I was writing about in my novel, Devil's Lair. I had been to Rome the year before, researching my first book, Valentino: a play in verse. On this second trip, I went to Florence, Naples, Venice, and Padua, but more importantly I needed to visit Lake Avernus and the Cave of the Sibyl. Lake Avernus is a volcanic crater lake near Naples. For the ancient Romans, this was the entrance to Hades, and "Avernus" was another name for the underworld. The name means "without birds." It was thought that the smell of brimstone rising from the lake was so poisonous that birds would not fly over it. In Virgil's Aeneid, Aeneas enters the underworld through the Cave of the Sibyl at Lake Avernus. In Dante's Inferno, the pilgrim Dante is lost in a dark wood and enters hell through an unidentified cave. 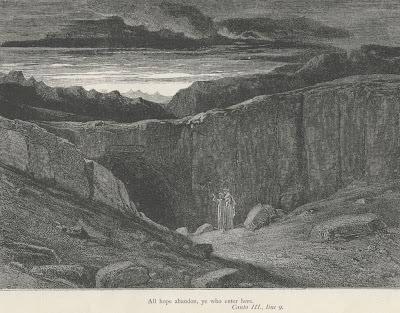 In Devil's Lair, Giovanni Boccaccio identifies Dante's entrance with Virgil's, and leads his pilgrims south to Lake Avernus, where they hope to find and enter the gate of hell. The entrance is described as "...a trapezoidal slit that looked like a keyhole in the crater." Hi there. The photo makes the lake look so mysterious... We went to Italy for the first time last October. Had the time of our lives. Saw all the places you mentioned except for Padua. My grandmother tells me it's beautiful there. No suprise -- Italy overwhelms me with its beauty. Here's hoping my next work assignment requires that I do research in Italy. ;-) I would have no complaints. It's great to be able to travel to the site of your novel. I'm working on one based further north of me and I don't want to visit until summer. I took the photo on a rainy day near sunset. I had planned to spend all day at Avernus, but there was a train strike in Italy that morning (typical), and I couldn't get out of Naples until mid-afternoon. I was even later arriving to the lake because on my way from Pozzuoli I got lost. Of course that was fitting, since all who enter hell are lost. Anyway, it was growing dark, but there was a short break in the weather and my picture of the lake turned out very moody. Which is pretty cool, given the location. As for Padua, I went there to see Giotto's Last Judgment, which is on the wall of the Scrovegni Chapel. If you're ever in Venice again, it's definitely worth a side trip. David Wisehart is a writer, director, and producer living in Los Angeles.